(1) Characterizations (observations, definitions, and measurements of the subject of inquiry). (2) Hypotheses (theoretical, hypothetical explanations of observations and measurements of the subject). (3) Predictions (reasoning including logical deduction from the hypothesis or theory). (2) Gather information and resources (observe). (3) Form an explanatory hypothesis. (4) Test the hypothesis by performing an experiment and collecting data in a reproducible manner. (6) Interpret the data and draw conclusions that serve as a starting point for new hypothesis. (8) Retest (frequently done by other scientists). 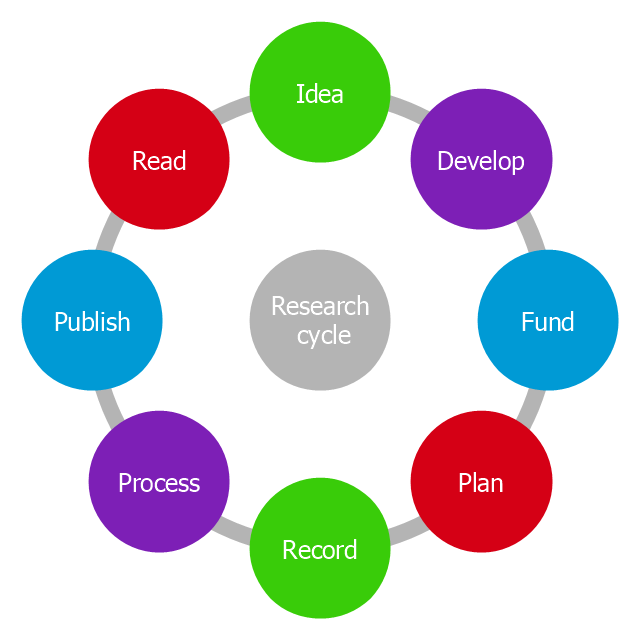 The circle diagram example "Research cycle" was created using the ConceptDraw PRO diagramming and vector drawing software extended with the Target and Circular Diagrams solution from the Marketing area of ConceptDraw Solution Park. This arrow loop cycle diagram sample was created on the base of the figure illustrating the webpage "Exploratory Advanced Research Program Hand-Off Workshops" from the US Department of Transportation - Federal Highway Administration (FHWA) website. 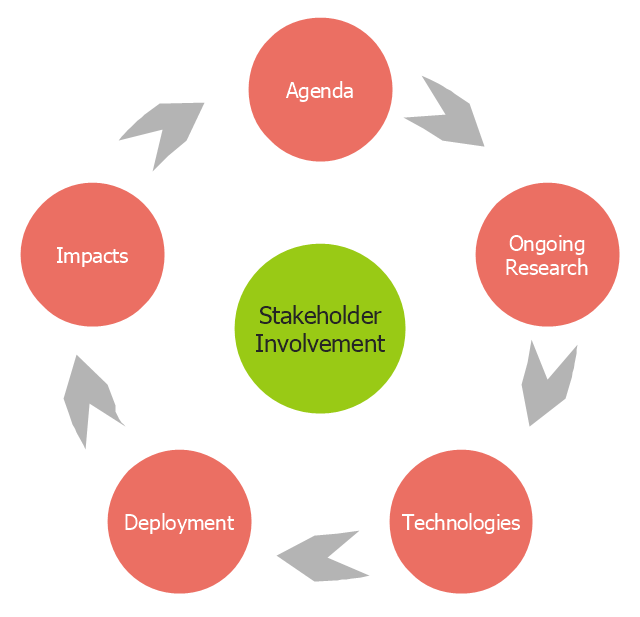 "The FHWA’s research and technology innovation life cycle illustrates that research and technology development are not insular activities, but integrated processes that together constitute a system. The arrow loop diagram example "Innovation life cycle" was created using the ConceptDraw PRO diagramming and vector drawing software extended with the Target and Circular Diagrams solution from the Marketing area of ConceptDraw Solution Park.